Need extra cash? Wish you had a way to earn money that didn’t require going into work 9-5 every day? If you’re looking for some creative and unique ways to earn extra cash, the answer could be right in front of you—in fact, you could earn money using assets, talents and hobbies you already possess and in your spare-time no less! Maybe you already have a job and you’re looking for a side hustle or work in your spare time. Sure, you could go around seeking out odd jobs or looking for something to fit your schedule, but imagine if you could earn money using something you already own. When I had my son, I was looking for ways to earn enough money to contribute to our household income while staying-at-home. I tried a whole slew of odd-jobs. I tested websites, sold jeans on eBay, and even ran a daycare in my own home (because what’s a few more kids when you already have your own?) to help out. 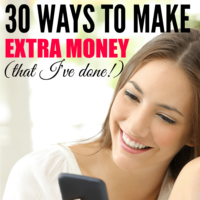 What I discovered is that there are tons of ways to earn extra money from home. In fact, you’re really only limited by your creativity and interest. There are lots of options if you need ways to earn. If you're set on being a stay-at-home mom, you gotta get creative when it comes to making money. Sound like a challenge? You can start some with some side-jobs that are convenient and easy for you. 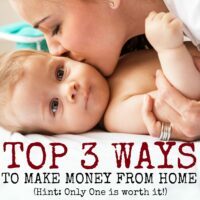 I found 4 jobs that made me over $3000 a month when I began my journey as a stay-at-home mom. It all comes down to finding the time, motivation, and passion you have for things that come easy to you and can make you a few extra bucks! 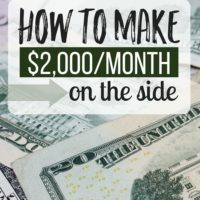 So if you're ready to take the leap, I've got some super helpful and creative ways to make extra cash that really WORK. Maybe you're not feeling very creative today, and that's okay because I've got you covered! 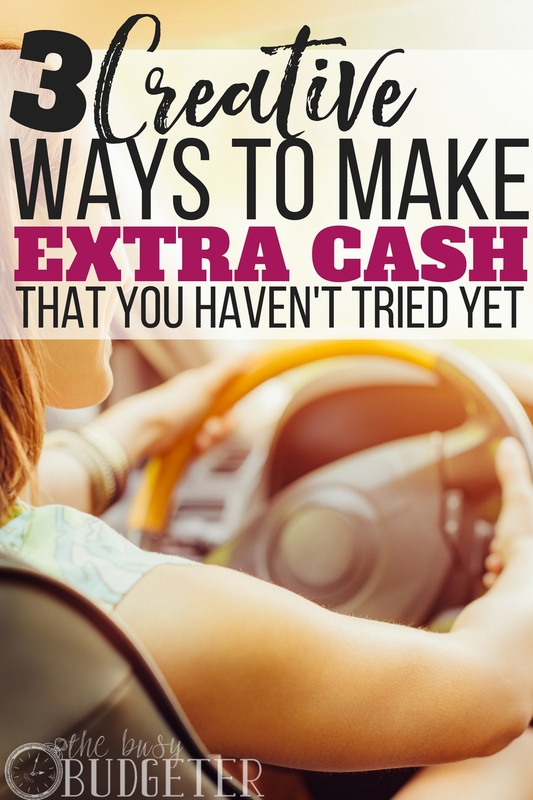 Here are three creative and unique ways to make extra cash that you might not have thought of. 1. Make Your Car Work for You: Drive with Uber. If you own your own car, have you considered Driving with Uber? This is especially a great opportunity if you’re very familiar with your city and enjoy meeting new people. How to Get Started: To get started, you’ll want to visit Uber’s website. You’ll need to give them information about your background, as well as details about the type of car you drive and the condition. You’ll need to provide license, registration and proof of insurance. To become an Uber driver, you’ll need a 4-door sedan with in-state plates. Your car will need to be at least a 2001 model or newer. Drivers need to show proof of residency, a clean driving record (a minor violation is okay) and must be 21 years or older. Why It’s Awesome: Uber is an awesome job if you enjoy driving and meeting new people. It’s interesting and you’ll interact with people from all walks of life. When you sign into the app, your route and driving is tracked, so you’re safe. People pay through their account on the app, so there’s no worries about carrying cash around. Plus, Uber’s flexible. You can set your hours and parameters. There are opportunities to earn money by doing deliveries and other services as well (some that can even run by bike). How Much You’ll Earn: Driving with Uber is a great way to earn money using something you already own (your car). The national average is around $20 per hour, but pay rates differ depending on the time of day and area (drivers can make more on weekends and in areas of town that are high-traffic or have a lot of events, like downtown areas). Drivers may work as few as ten hours a week, or way more depending on how busy your area is. It’s really up to you. One area to calculate into your expenses is the cost of gas and maintenance on your car. You’ll also want to figure in taxes. Drivers with Uber are independent consultants, rather than employees, so you’re responsible for reporting and paying tax. Another option for earning money with an asset you own: consider joining Airbnb! If your house has a spare room or two, becoming an Airbnb host is a fun and interesting endeavor to check out. There are a couple factors to consider: you need to feel comfortable with strangers in your house, you need to keep your house clean, and you need extra space. It’s not for everyone, but it’s definitely a great opportunity for the right person! How to Get Started: To get started with Airbnb, visit their website and walk through the application process. You’ll want to do research beforehand to check out what other listers are charging for their space and how many different postings there are in your area. You may also want to read and research reviews from other Airbnb hosts, or even stay in a local Airbnb yourself to get a feel for the process. You set your own availability and pricing for your listing. You’ll also need to write an overview of your house, explaining all the information, details and amenities your home has to offer. You’ll include photographs of your home and submit your application for approval. Users will then sign up to rent space from you and review your space (and hospitality) after. Why It’s Awesome: This is another great opportunity for someone who’s comfortable with new people, owns their property and doesn’t mind the idea of visitors in their home. You get to welcome people to your town, provide them with a great home-away-from-home and give them insight into local culture and events. Airbnb is particularly good for those with plenty of space or those who don’t spend all their time in one location. There are people who list their property during big sporting events or tourist season, and live in their property the rest of the year. If you have a vacation home, you can rent out the space and make money when you aren't staying there. You can charge a higher rental fee for a whole house or apartment rather than just an extra room or two. How Much You’ll Earn: Rates for Airbnb listings vary by area and size. The service retains 6-12% as their fee. There are people who earn thousands of dollars per year through Airbnb listings of a second property (although that’s not the typical scenario). You’ll need to figure in your time for cleaning (or paying a cleaning service) and sprucing up your listing. While guests expect a home-experience, your reviews will improve if they get a “clean, inviting home experience.” Guests are responsible for all their own needs like food and transportation. They are charged a security deposit for any damage incurred during their stay. 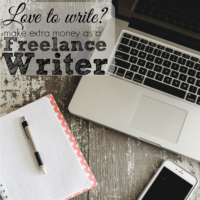 Time and time again, I get asked if people really earn money blogging, if blogging is a scam or a pyramid scheme, or if there’s a trick to earning money blogging. I’m here to tell you—blogging is a legit, for real, honest way to earn money! If you love writing, sharing with others and feel passionately about a topic, blogging is a great job (not that I’m biased at all)! How to Get Started: It couldn’t be easier to get started blogging. You literally need a computer and your brain. That’s it. You don’t need a car, you don’t need to be a homeowner, you don’t need to work on a set schedule. All you need is knowledge on a topic and a desire to share. There are free platforms (like Blogger) where you can start blogging to see if it’s right for you. One word of advice though—if you even think you MIGHT want to turn your blog into a source of income, set it up on WordPress to start. It’s slightly more complicated (not much—I did it and I’m definitely not a computer genius) but in the long run it’s worth the effort. Check out my step-by-step guide to start your blog today! Why It’s Awesome: Uh, duh! You guys, blogging really IS super awesome. It’s not hard. I mean, there are challenges of course, but it’s not digging a ditch, performing brain surgery or rocket science. It’s flexible, it’s creative and it’s fun! When you blog, you get to share your knowledge about a topic you’re super passionate about. For me it was budgeting and managing my home. For you, it could be home decorating, parenting, or farming: the sky’s the limit! The most important part of blogging is you love what you’re writing about and you feel excited to keep writing about your topic all the time. That’s it! How Much You’ll Earn: It took me 12 months of blogging before I reached a full-time income. Many bloggers take longer (although some hit the mark faster than I did too). One of the biggest game-changers for me was a class called Elite Blog Academy. EBA took me from “hobby blogger” to professional blogger, step-by-step. Elite Blog Academy taught me how to make a full-time income from blogging, every step of the way. The biggest drawback of Elite Blog Academy is that it only opens for registration 5 days a year, so unless you have perfect timing, it’s unlikely you’ll get in unless you join the waiting list here. Today, blogging has taken me and my family beyond our wildest dreams. I’ve been able to grow my blog into a thriving business. It’s turned into something much larger and more wonderful than I thought possible. I can’t say blogging is the perfect job for everyone, but it’s definitely perfect for me. If you’re teetering on the idea of starting a blog, I say go for it! You won’t regret it! If you’re looking for unique ways to make extra cash, there are all kinds of jobs out there. Check out these three awesome opportunities to see if they’re the right fit for you. What’s your favorite creative ways to earn some extra cash? Do you have a side hustle? Let me know about any other unique ways to make extra cash that have worked for you! Another great way to make money from your hobby is to start an online store via Etsy or another market place. It doesn’t require as much capital as a traditional store and you can set your own hours. I love the fact that’s can make money during my spare time using my hobbies. I decided to take a crochet project with me to the dicots, airport, train ride etc. When I sold my scarves and blankets made only in spare time, I made a whopping profit. I also bake cakes especially for Christmas and birthdays. The money made is all mine! Thanks for sharing these three creative ideas with us. I love your advice on how to start a blog! You were a great inspiration to start a blog of my own. I love writing and hope to make enough money one day to retire my husband. Never tried any of the suggestions mentioned above, however, I had a friend that moved to L.A. briefly and was renting through AirBnB which worked out well as long as the landlord is competent (he had an issue with that). While he was out there he was a lyft driver and told me he could make $25-30 an hour by only working the surge times and he ended up only working 30 hours a week. Took some trial and error but he formulated and researched the best driving times and locations to make that kind of money. Hopefully I can interview him and get the nitty gritty details. Letting your Hobby work for you by means of a Blog is sure way to generate a passive income. But with Blogging the Target Keyword Placement is crucial. The more challenging part of blogging however is SEO, but it is also the more profitable. Because nothing on Earth drives Web Traffic like SEO. A hobby works well, because it is important to have sufficient knowledge. And when you love what you do. Not only will you crate great content, but also inspire your audience. After all, to blog is to inspire and share ideas.